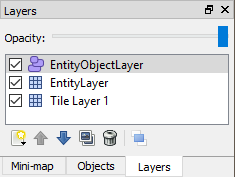 In the previous tutorial we covered how to create entities from tiles. This approach can simplify entity creation, and works great for entities which are uniform (each instance is identical aside from position). 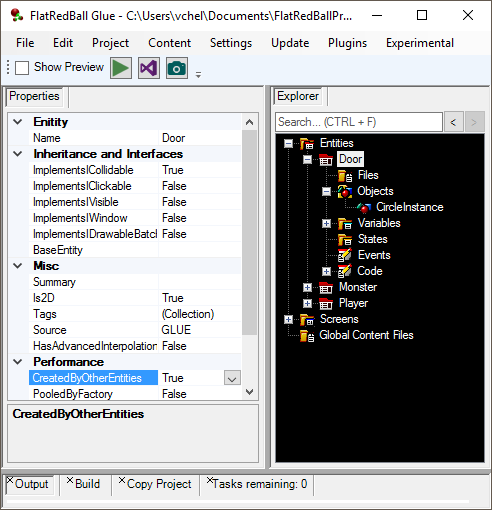 Some entities require custom properties per-instance. For example, consider a game where players can walk through doors to enter other maps. 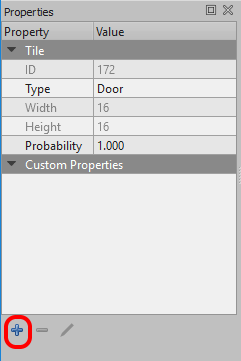 In this case, each door entity needs to have a custom property for which level it links to. 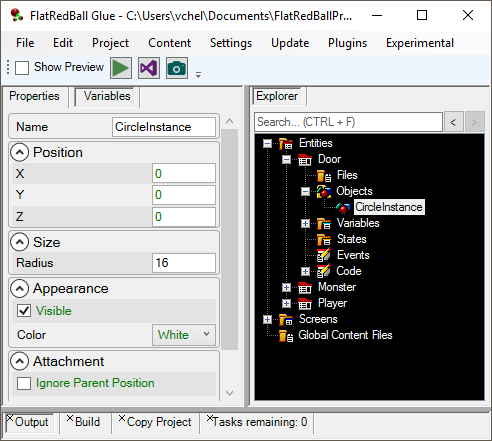 This walk-through shows how to create object layers in Tiled and how to create entities using these objects. 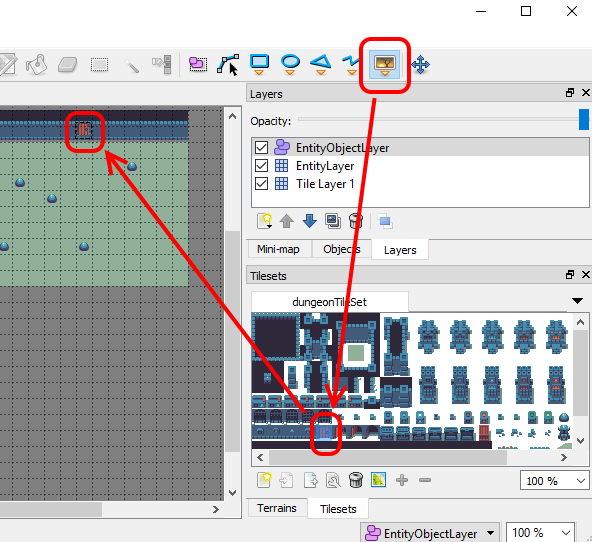 For this tutorial we will be creating a Door entity which can be used to move the player from one level to the next. 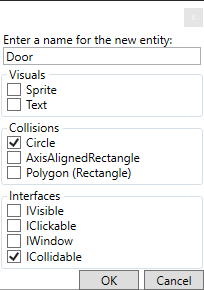 This entity will need to have collision so that the player can collide with it and we can respond to the collision. 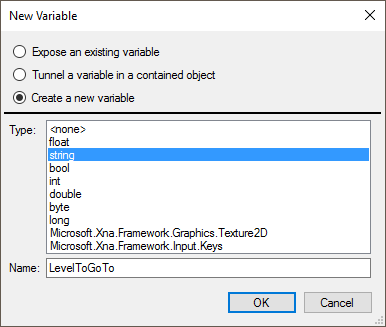 The name of the variable that we created (LevelToGoTo) needs to match the name of the property that we will be adding to the tile later in this guide. 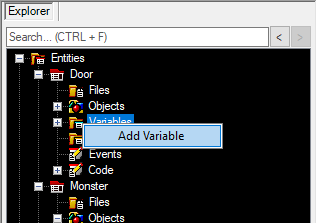 Note that if using a entity types XML, the property will automatically be added. 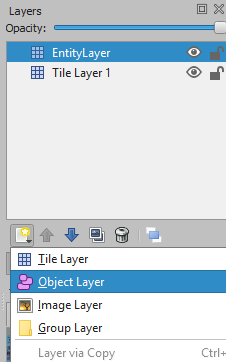 Tiled object layers allow placing geometric shapes (such as rectangles, circles, and custom polygons) as well as images not bound to tiles. 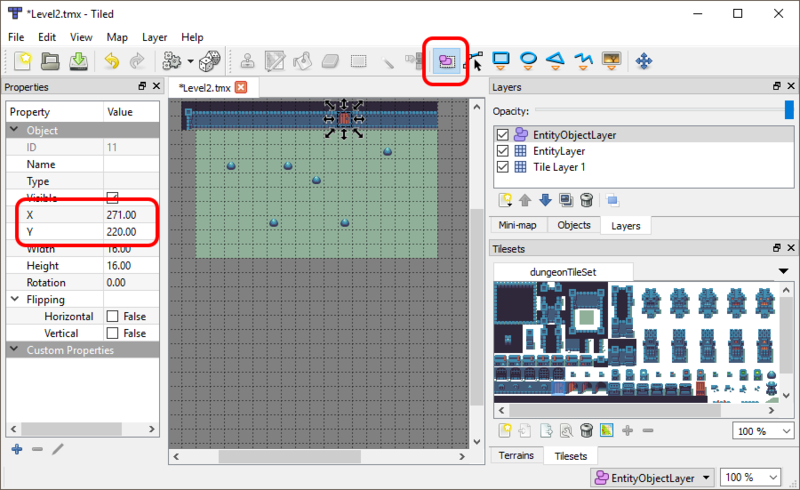 These images (also referred to as “tiles” in the Tiled program) can be used purely for non-interactive visuals or can be used to place entities. 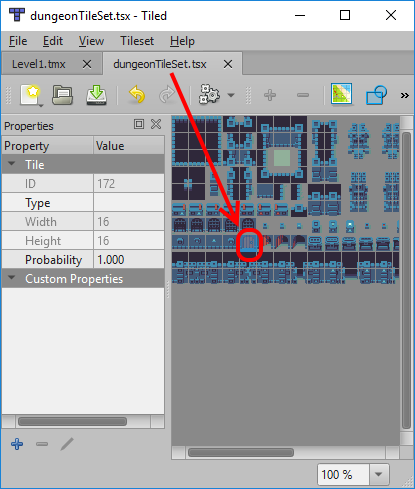 Objects can be created and added to tile maps, where each instance has all of its properties set individually, or objects can be given default properties in the tileset. We won’t assign the value of LevelToGo yet, we’ll do that per-instance. 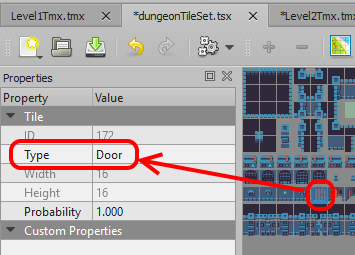 Now that we’ve defined the Door tile properties, we’ll a Door to the Level2Tiled.tmx file. 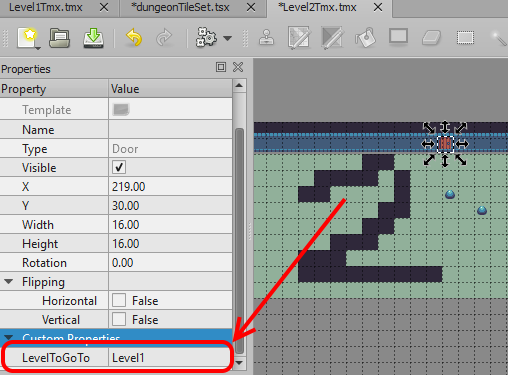 Enter the value Level1 for the LevelToGoTo property. More generally, the door’s LevelToGoTo property should be the name of the screen that we want to go to when the Player entity touches the Door. 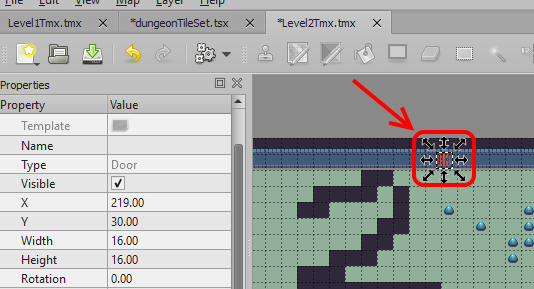 Don’t forget to save the tile map. 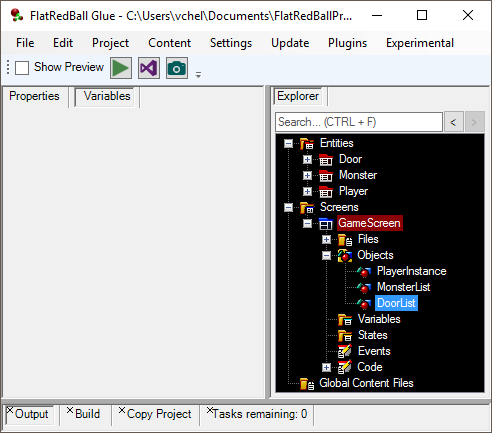 This entity was automatically created by calling CreateEntitiesFrom , which we added to GameScreen.cs in the previous tutorial. 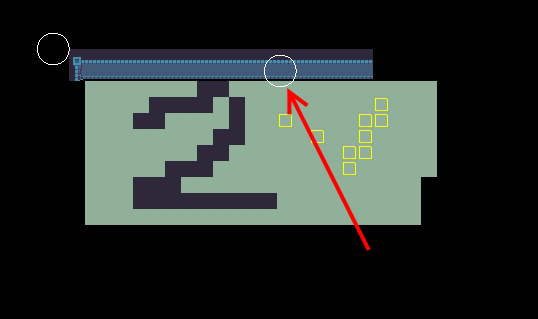 If the player touches the Door the GameScreen will restart itself on Level1 (or whichever level is referenced by the Door).